Within a few moments of talking to Alistair Duncan his passion for Arthur Conan Doyle’s work shows. He is working hard on his fourth book ‘An Entirely New Country’ due out in a few months time which covers Conan Doyle’s time at Undershaw, probably his most famous home. The future of Undershaw is uncertain with the Undershaw preservation Trust (of whom Duncan is a strong supporter) fighting to preserve the house in Doyle’s memory. We dragged Alistair away from his research to ask him a few questions about the new book, and a few about his previous three books which have established him as one of the most interesting Holmes historians of our time. When the BBC needed an expert to review the first episode of Sherlock in a live interview on BBC Radio 5 live on the day it was to air, several million listeners heard Duncan’s honest, frank and generally very positive comments on the latest incarnation of Holmes and Watson. So why is one of our main Holmes historians focussing on the Undershaw years of Conan Doyle’s life? 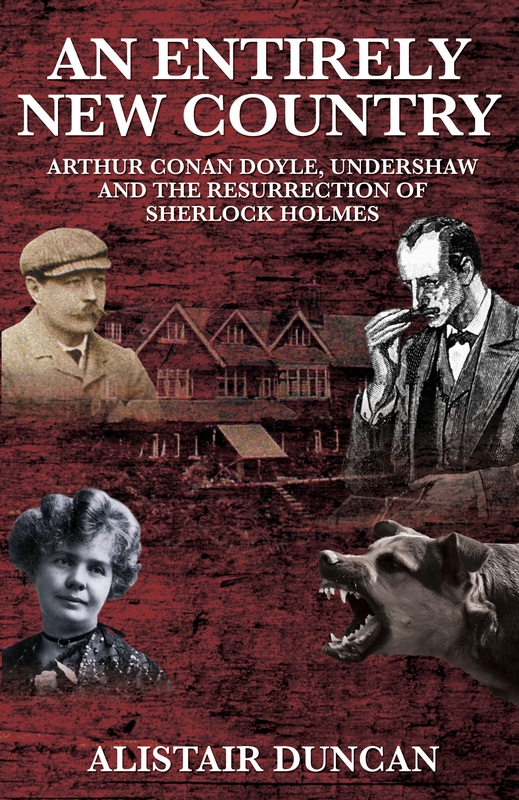 Undershaw is where many of the seminal moments in Conan Doyle’s life occurred and the book is shaping up to be one of the most eagerly awaited Sherlockian books of the year. Duncan’s attention to detail and meticulous research is renown. His bestseller by far was his 2nd book, Close To Holmes, a travel guide to London that highlights places important to Holmes and Conan Doyle. What has been the most interesting new aspect you’ve unearthed about Undershaw? It needs to be remembered that this book is not specifically about the house but about the period in which ACD lived in it. As a result I’ve discovered very little about the physical house that was not already known. One of the few things that the book will show that I don’t believe has been seen much is the architect’s original sketch of how he planned Undershaw to look. Why do you think preserving Undershaw is so important? Undershaw needs to be preserved because it is the only remaining house of ACD’s that has not been either lost or turned to some other purpose (apart from its stint as a hotel). It also enjoys the distinction of being the only house that ACD personally designed and commissioned. Tell us something unusual about the building? It was built very much with Louise Conan Doyle in mind. Consequently most doors opened both ways and the staircases had shallow steps. All this was designed with the aim of enabling Louise to move around the house with minimal effort as she had increasing difficulty breathing. What famous visitors did Conan Doyle have while he was at Undershaw? What was the main inspiration for the book? After my last book (The Norwood Author) I was searching for another project. I had no plans at that time to write about the Undershaw years but a number of people independently suggested that they’d like such a book to exist so I thought I should bow to the pressure. In addition – Undershaw represents, in they eyes of many, Conan Doyle’s literary apex and it needs all the publicity it can get in light of attempts to damage it forever. Which is your favourite aspect of the book? It is a chance for me to focus on a ten year period of Conan Doyle’s life that saw a huge amount of personal upheaval and literary output. It also saw Holmes become a dramatic hit at the Lyceum. Of all the Holmes stories which is your favourite and why? It has to be The Sign of Four. For me it has everything a classic adventure story needs. There’s a romance, treasure, exotic assassins, far off lands and a crime for the detective to solve. When did you first become interested in Sherlock Holmes? At age eight when I saw the Basil Rathbone film The Scarlet Claw. From there it was a short step to the books and the rest as they say……. If you could meet Arthur Conan Doyle on his forthcoming birthday, what would you ask him? I fear that Conan Doyle would not like me very much. That’s not because I have any objectionable characteristics (well I hope not) but because of my love for Sherlock Holmes. Let’s not forget that he could never understand the fascination that the public had for the character and wanted people to remember him more for his historical novels which, I regret to say, I have little interest in despite owning three of them. I also do not share his belief in spiritualism so I think we would struggle to sustain a long conversation. If he could stand the question I would probably ask him if he had ever been tempted to use Holmes as a platform for his spiritualist beliefs and why he never gave into that temptation. After a great many Holmes pastiches I am currently reading a biography of Erwin Rommel. What’s the best aspect of being a Holmes author? I think the best aspect (aside from the process of writing) is being recognised and respected as someone whose opinion is worth having. How do you view the new adaptations of Holmes – the BBC’s Sherlock and the Guy Richie directed movies? Every screen adaptation of Holmes has taken some liberty or other. In this respect the latest offerings are no different. Where they are different is in the nature of those liberties. Richie’s movie made Holmes a lot more physical (and scruffy) than the books suggested but in other respects it was more canonical than many of the old movies that preceded it. The BBC series is following in the anachronistic footsteps of Rathbone but apart from its time setting it is arguably the most faithful depiction of the Holmes/Watson relationship that we have had since Granada’s series in the 1980s. Which other modern day Holmes writer do you most enjoy? Difficult question as I don’t tend to read many. Les Klinger’s New Annotated Sherlock Holmes is naturally a must-read for any Sherlockian. However the biographical works of Georgina Doyle and Andrew Lycett have been the most enjoyable of recent years. An Entirely New Country will be available from all good bookstores and in all formats and is already available for pre-order through Amazon UK. For more interesting information on Sherlock Holmes you can follow the very popular Alistair Duncan’s Sherlockian Blog and join the Sherlock Holmes Books Facebook group.